As concerns towards unconventional gas in Western Australia continue to grow, the town of Irwin has become the fifth community in the Mid West to declare itself gas field-free. The declaration is a sign of solidarity within the community against the unconventional gas industry — and the State Government, should they want to explore or frack gas wells in the district — but does not carry any legal standing. Irwin melon farmer Rod Copeland handed over the declaration to the Shire of Irwin President Stuart Chandler and councillors who attended the event. He said for the event to have the support of the Shire was a novelty. "They are the first call. They set a lot of the agenda locally for what happens," Mr Copeland said. "We feel they have been very pro oil and gas and ... not necessarily against us but not with us. "The fact that they are here means that the community has put some pressure on them and we can talk to them and try and get them to listen to what we have to say." He said going forward the voice of communities in surrounding regions and other areas of the state would only get louder in response to unconventional gas exploration. 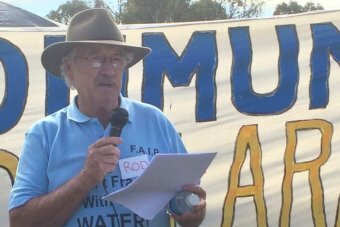 "It's all about water and the valuation of our land and other matters that go on our health, our environment, the river," Mr Copeland said. "We're sending a message to [the] Local Government, [the] State Government and even [the] Federal Government that we want proper consultation and consideration. "It's not because we were here first, it's because we will be here after and we don't want to have to put up with the mess and have to clean it up in future generations. "We're going to spread the word and the message [that] we don't want fracking anywhere in this shire, in this state, in this country, or even the world." Mr Chandler said the council had to be aware of the views of all their rate payers. The declaration was supported by 98 per cent of the local community and surrounding town sites such as Dongara have supported conventional gas explorations for a number of years. "Obviously there's a group of our community that are very passionate against any continuation of fracking or unconventional gas extraction within the community," Mr Chandler said. I'd urge residents to look beyond the scare campaign and look to the facts. "A lot of our ratepayers and electors are in the industry and they rely on the gas and oil industry for their income source, so keeping that in mind, the Shire has remained neutral in the debate. "We retain a position of advocacy on behalf of those like this group and I'm here to receive that declaration on behalf of the council." The Knitting Nannas, a peaceful protest group that originated in New South Wales in response to unconventional gas exploration, also attended the event in Irwin. One member, Annette Copeland, said the group was growing in Western Australia. "We hope to protest in that we don't want any of the gas wells in our areas fracked," she said. "The water in this area is so important to all of us who produce here — mangoes, rockmelons, everyone who lives out here relies on groundwater. "The water table is also very high so if they frack any of those wells and contaminate any of our water ... we are doomed." Member for Moore Shane Love, who attended the event, said the message was clear and the Government should respond sympathetically. "It's an indication this community is concerned about fracking and the development of unconventional gas in their area," he said. "In Irwin there's been the experience of gas in a conventional sense and Dongara has developed along with the gas industry over the years. "I think this does demonstrate though that people are concerned about the move towards unconventional gas. "I think this is incumbent on government to make sure the community feels as comfortable as possible on any move to unconventional gas and to be confident in the regulation and safety of that. "The Parliament of Western Australia is undertaking an inquiry at the moment into the safety of the unconventional gas industry and I'm very, very interested in how that committee's findings will read when they do finally come out. "It will lead to conflict and a difficult period here if gas was going to be pushed onto these communities. "It's important that the Government works hard to listen to the community." Chief operating officer for the western region of The Australian Petroleum Production and Exploration Association Stedman Ellis said communities considering a declaration in the future should keep an open mind. "I'd urge residents to look beyond the scare campaign and look to the facts," he said. "The facts are that fracking is a safe, reliable, well-understood technology that's been used in WA and elsewhere since the 1950s and demonstrably it's had a very significant positive impact in other regional communities. "So for those who are looking to campaign, I'd say keep an open mind, look to the history of the oil and gas industry in WA and look to Queensland, where the gas industry has reversed the decline in many regional communities. "These kinds of declarations don't have any legal status; they are a campaigns tactic by those opposed to the gas industry. "The consequence is that it can confuse and scare people and I think unreasonably lead some of the community to miss out on some of the opportunities that the gas industry can bring in terms of jobs and economic opportunity and environmental responsibility to the region."